Reflecting JMA’s national reputation, a one-page profile of John Mitchell was published in the small business section of The Business Review Weekly, 20 November 1995. Further articles appeared in The Australian on 26 March, 2 April and 30 April 1996, Melbourne Age, 28 April 1998, and The Australian Financial Review, 26 June 1998. The company’s headquarters are in Sydney, New South Wales. Clients include health departments and hospitals, State Governments, State TAFE Departments, 15 Australian universities, the Securities Institute of Australia, Telstra, Western Mining Company, F.H.Faulding & Company and other large corporations. View articles from JMAs Media Reports related to e-health. written and verbal evidence to the House of Representatives Telemedicine Inquiry. JMA’s reports “The Challenge to Embed Telepsychiatry”, “Establishing Renal Clinical Telemedicine” and “Best Practice in Telemedicine” have drawn accolades from around the world. The Commonwealth Report “Health Online” recommended JMA’s evaluation reports be read by every telemedicine project in Australia. An article co-authored by John Mitchell, Benjamin Mitchell and Dr. Alex Disney, “User Adoption Issues in Renal Telemedicine,” has been published in the international Journal of Telemedicine and Telecare. From 1995- June 1998, JMA has given presentations to more than 20 national and international telemedicine conferences including one to Singapore and another in New York. 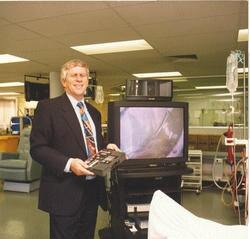 In June 1997, John Mitchell presented by videoconferencing from Adelaide to Lisbon, Portugal, to the ITU’s World Symposium on Telemedicine on the topic of “Optimising Benefits by Using Integrated Telemedicine”. John Mitchell is also the main author of the comprehensive 1994 study of a pioneering telemedicine user, the NT’s Tanami Network, entitled “Flourishing but Fragile” and is co-author of the Tanami’s successful submission to the Commonwealth for expansions funds. and links from the endoscopy section of St Vincent’s Hospital in Melbourne hospital to the Ascot Vale campus. JMA works across Australasia. John Mitchell was a keynote speaker at the Asian Pacific Videoconferencing Conference in Singapore in November 1994 and conducted a half day workshop on implementing a videoconferencing system for personnel from Indonesia, India, Singapore, Hong Kong and Thailand. In 1994 John Mitchell & Associates undertook an analysis of Telecom New Zealand’s eleven site videoconferencing network and prepared the report “Videoconferencing as a Business Tool,” resulting in very substantial savings in travel budgets for Telecom New Zealand. In mid-1995 JMA conducted training by videoconferencing for staff employed by the pharmaceutical company F.H. Faulding in Hong Kong and New Jersey, USA. In October 1996 John Mitchell conducted the Workshop on Planning, Managing, Evaluating and Marketing Your Telemedicine Network at TeleMed ’96 in Singapore. The Conference features 12 speakers from seven different Asian countries, two speakers from European organisations, 13 presentations from United States telemedicine organisations and just one from Australia. JMA was the sole Australian company invited to present. In October 1996, John Mitchell addressed the Health IT Conference in Hamilton, New Zealand, on telemedicine implementation issues. John Mitchell has been invited by the Scientific Committee to present a paper at The Royal Society of Medicine’s sixth annual international conference on telemedicine, TeleMed ’98 November 25-26 in London.. The title of the paper is “The Uneven Diffusion of Telemedicine in Australia”.